We’re excited to announce the second auction of original art work by the amazingly talented Andy Swist. Last year we auctioned a Bill and Sookie painting by his hand, now it’s time for the Team BAM painting Andy made of Bill and Sam. Remember that scene between Bill and Sam in True Blood season 3….. ? I bet you do….! Andy Swist is a New York based illustrator and graphic designer, best known in the True Blood fandom for the Bloodwork True Blood vlogs he does together with husband Brian and the True Blood paperdoll collection. 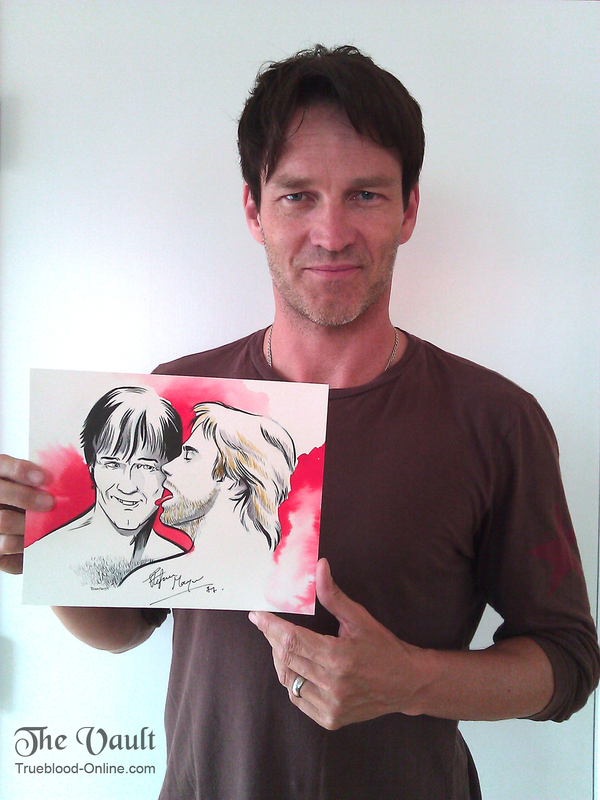 Stephen Moyer is a fan of Bloodwork and he told us that he thinks that “the Andy pictures are amazing”. And we totally agree with him! The proceeds of this auction will be donated to The Surfrider Foundation, an organization that is very close to Sam’s heart and that he has supported for many years. The Surfrider Foundation is a non-profit grassroots organization dedicated to the protection and enjoyment of our world’s oceans, waves and beaches through a powerful activist network. 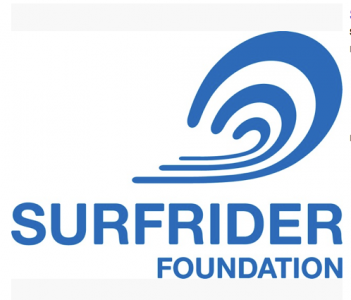 Founded in 1984 by a handful of visionary surfers in Malibu, California, the Surfrider Foundation now maintains over 250,000 supporters, activists and members worldwide. For more information on the Surfrider Foundation, visit www.surfrider.org. Follow Surfrider on Twitter or Facebook. 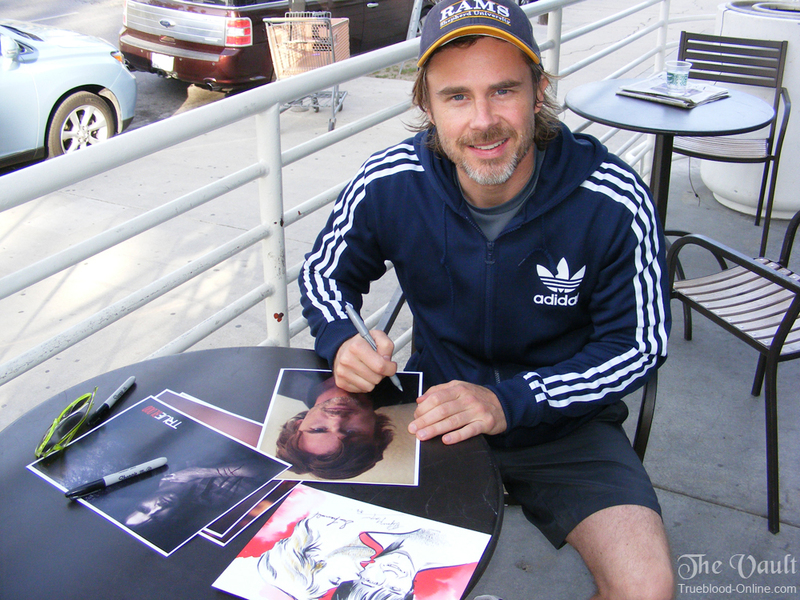 Lynnpd of The Vault met up with Sam Trammell last year at the yearly Surfrider event in Malibu. Sam told her why he supports the organization. Read the complete coverage of the event here. The auction winner will also receive the HQ photo files of Sam and Stephen with the items. You can support Surfrider also by making a donation. A wonderful picture by the very talented Andy Swist. I well remember the Bill and Sam scene … one of the highlights of that season for me. This is a terrific auction for a very good cause. I hope a great deal of money is raised for the Surfrider Foundation. Really nice package! I bid, so we’ll see what happens. It was nice to see the video of Sam from September. Keep the great work up!- LOVE YOU GUYS!